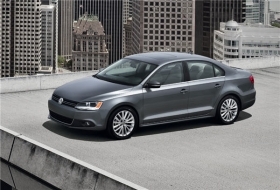 VW plans 100,000 annual sales of the new Jetta in the United States. DETROIT (Bloomberg) -- Volkswagen AG CEO Martin Winterkorn will explain today how he plans to return VW's U.S. unit to profit as it heads for an eighth annual loss. He'll do so without a leader to oversee the turnaround. The CEO hasn't named a permanent successor to U.S. chief Stefan Jacoby almost a month after the VW veteran stepped down. Jacoby's exit coincides with the final phase of introducing a new Jetta compact, VW's best-selling American model, and as VW prepares to open a factory in Tennessee and present the first car built for the U.S. market. Winterkorn, who will discuss VW's electric-car strategy in California and test drive the Jetta, has pledged to almost triple VW's share of the second-biggest auto market to 6 percent by 2018 and boost deliveries to 1 million cars, including the Audi luxury unit. U.S. progress will be vital for VW to reach its goal of surpassing Toyota Motor Corp. in sales and profitability, said IHS Global Insight Inc.'s Rebecca Lindland. Winterkorn, 63, is banking on localization of models and giving up the VW's premium-pricing strategy in the U.S. to better compete with small-car leaders Toyota Motor Corp. and Honda Motor Co. The new Jetta, VW's first model altered specifically for the U.S. market, is 3.5 inches (89mm) longer than the European version. VW is targeting annual deliveries of more than 100,000, with the model going on sale in October, according to Mark Barnes, interim chief of the VW brand in the United States. VW cut the extended Jetta's price to about $16,000 from the current base of $17,735. The reduction brings it closer to the starting prices of Toyota's Corolla and Honda's Civic, now $15,450 and $15,455 respectively, according to company Web sites. The price cut is “a distinct change” from the past when VW kept a U.S. pricing premium of as much as 10 percent, said Ferdinand Dudenhoeffer, director of the Center for Automotive Research at the University of Duisburg-Essen, Germany. Jacoby's successor will have to capitalize on the $1 billion plant in Chattanooga, Tennessee, scheduled to begin production in the third quarter of next year, and lift sales by designing more models for the United States, said Juergen Pieper, an analyst at Bankhaus Metzler in Frankfurt who recommends buying VW stock. Winterkorn has pledged to almost triple VW's share of the US auto market by 2018. By 2013, VW wants 85 percent of vehicles sold in the United States to be produced in Chattanooga and in an existing factory in Puebla, Mexico, where the new Jetta will be built and where the carmaker plans to invest as much as $1 billion over three years. VW unexpectedly named Barnes and Michael Lohscheller on June 24 to run the U.S. operations on an interim basis, saying the company was holding contract talks with Jacoby. 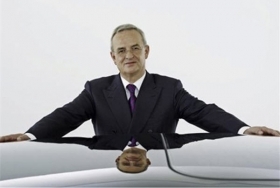 The negotiations focused on Jacoby's obligations to VW before he takes over as CEO at Volvo Cars, people familiar with the matter said June 25. As recently as June 15, Jacoby reaffirmed a plan to return the U.S. operations to profit by 2012 or 2013. The division last reported a profit in 2002. Besides the revamped Jetta, VW is counting on a new mid-sized sedan, its first car built for the United States from scratch, to help lift its market share from about 2.2 percent so far this year. VW is targeting annual deliveries of 150,000 of the model, which will be assembled in Chattanooga and go on sale next year. Winning customers for the new car will be “an uphill battle” in a “highly competitive segment” that includes models such as Toyota's Camry and Honda's Accord,” said Anil Valsan, director of automotive research at Frost & Sullivan in London. “I doubt that the new sedan by itself will suffice to propel their U.S. business,” Valsan said. Winterkorn will visit the manufacturer's electronics-technology research facility in Palo Alto, California. Tomorrow he'll take part in a drive presentation of the new Jetta. The CEO, who travels to the United States regularly to test drive vehicles, has repeatedly vowed to turn around the American operations and said July 6 that he plans to name a successor to Jacoby as soon as possible. Some analysts say Winterkorn may be able to minimize the disruption from Jacoby's departure.